Greek Pascha, which was almost always celebrated together with time-honored customs and traditions, gave the slaves hope and optimism. The festive tumult of the bell, the hymns glorifying the victory of life over death which Christians chanted in Orthodox churches, the elevated mood enhanced by nature in the Spring, created on the night of the Resurrection of Christ and all the days of Pascha a vitality and optimism for the future. The first "Christ is Risen" was welcomed with homemade fireworks, with noisy and triumphant acoustic elements. Armatoloi and Klefts gave to the feast with their armed presence an image of a living militant people and brought a spirit for revolution. They celebrated with dances and songs, with food and drink and warm wishes of "Christ is Risen", "Good Resurrection to the homeland", "And to next year, with freedom".... Even the dances of the group paschal dances had a national, awakening content. The tyrannical decrees of the conqueror that forbade Christians to celebrate in festive and beautiful colored costumes, were defied in many parts of the country. Pascha should be celebrated with brilliance even with the clothing of the slaves. This is why a Paschal song of the time said: "Today old women put on red aprons...". In Epirus, where this was sung, older women almost always wore black, as they do also in our present day. Regarding certain Paschal customs of the Greeks in the time of slavery, foreign travelers to Greece at the time spoke of them. The English diplomat Sir Paul Rycaut2 wrote in 1679, that Christians at the Resurrection exchanged a brotherly kiss. They kissed three times on each cheek and on the mouth. Another Englishman, Thomas Smith,3 wrote in 1680: "On Holy Saturday the Christians eat only once, enough to keep them on their feet. At three in the afternoon Vespers begins and goes throughout the night, many having with them bananas, figs and the like with the purpose of using them to avoid fainting from hunger. At dawn the Liturgy begins with 'Glory to God in the Highest' and there follows 'Christ is Risen'." It is also reported by a foreign English traveler in 1682 regarding the Resurrection kiss at Pascha in Athens, that before kissing, the Christians who were in a rivalry had to kiss in order to show they were not atheists or pagans. On the Sunday of Pascha in Athens all the parishes celebrated the Resurrection Liturgy separately, but on Monday in only one church, at the cathedral, where all the Athenians attended church together with their families. On this day, according to the custom, the Metropolitan sent large candles to the influential persons of the city. The first priest also did this in each parish. Lastly, we must mention that the conquerors were often planning in certain places on the major feasts of the slaves, the executions of Christians who were condemned for various charges, and in particular for not changing their Faith. In this way they succeeded in making the brilliant festival of Pascha "black", but it did not bend their morale. 2. The Present State of the Greek and Armenian Churches, Anno Christi 1678, Written at the Command of his Majesty, London 1679. 3. An Account of the Greek Church, Oxford 1680. Travelers in the 18th century noted that Christians had to pay five hundred piastres to Mouselimi in order to purchase their right to celebrate. In this way they were free to celebrate Pascha in their homes and in the streets. On Saturday night towards Sunday a multitude of Christians filled two churches. Most put in their mouths what they had, since they could no longer bear the fast which they endured with reverence for forty days. For three days nothing else was heard in the streets, in the courtyards and in the homes but the voices and dances of the Greeks. 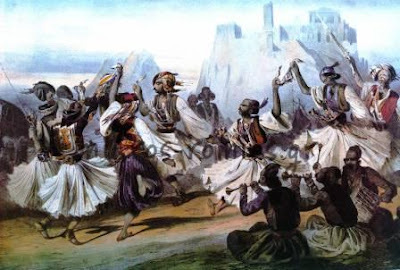 Greeks danced to the French horn, bagpipes, tambourines, and drums. The Swede Frederic Hasselquist informs us of the thousands of Greeks who poured into Jerusalem during the years of slavery. On the day of Pascha in 1750 he found the streets of Jerusalem to be flooded with Greeks "who made a thousand follies and competed to surpass one another in food and drink. They crossed the Frankish road dancing to the accompaniment of musical instruments." The traveler records the moment where the Greeks would balance a bottle full of water and roses on their head with the joyful cries of "Christ is Risen". However, the Pascha that will remain unforgettable to the slaves was that which took place on the 10th of April in 1821. After the Paschal Liturgy the Ethnomartyr Patriarch Gregory V was arrested and hanged at the main gate of the Patriarchate. 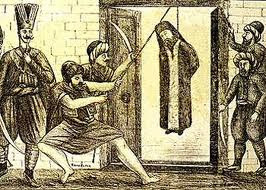 He remained hung for three days until a mob threw his corpse into the Golden Horn, and from there it traveled to the Cathedral of Athens. On the day of the assassination of the Patriarch, Athens had not yet risen up in revolt. The enslaved avoided the dozens of churches in the city and chose the Monasteries of Attica and the chapels in order to be far from the Turks. The messages came from everywhere: the Turks were rising up and preparing for a massacre. The Greeks bid their time on that Resurrection day, and those who remained in the city celebrated with angry Saracens strolling outside the churches. The priests chanted "Christ is Risen" faster and the enslaved regularly checked the door. The next Pascha everything was different and Greece lived with the fever of the struggle for freedom.